Come see a beautiful home that has been tastefully updated! This spacious floor plan is ideal for full time resident or luxury vacation home. Granite counter tops, brand new stainless steel appliances with a GAS stove in kitchen, new washer/dryer & pool heater, completely remodeled upstairs bath, custom stair rail, automatic storm shutters & A/C installed 2015, new tankless water heater, reverse osmosis system and more. The first floor master has TWO huge walk in closets with a soaking tub and tile throughout main living area. 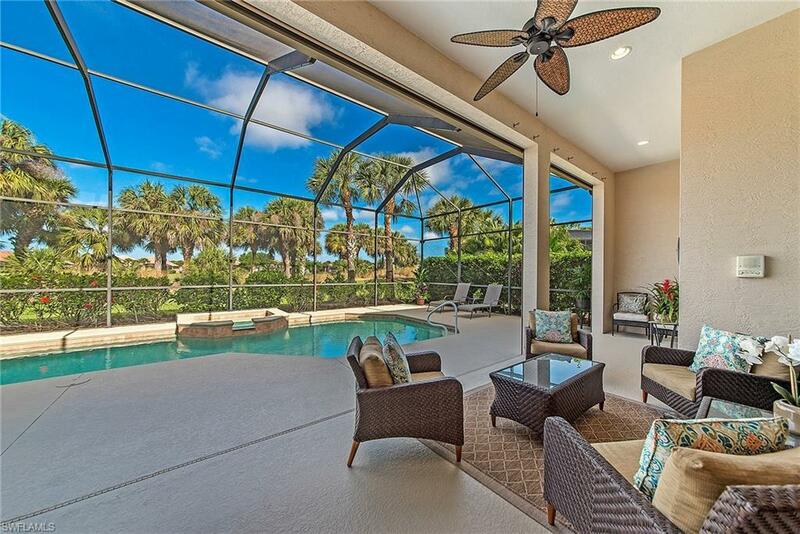 The large lanai is perfect for entertaining family and friends or just relaxing alone. Enjoy paradise in Miromar Lakes with unparalleled amenities such as tennis courts, pickle ball, a state-of-the-art fitness center, full service salon and spa, marine services, clubhouse boat docks, boat rentals, infinity pool with poolside service, 2 restaurants, and three miles of white sandy beaches with cabanas and hammocks throughout. Miromar Lakes has a year round active social calendar with events and entertainment suitable for everyone. If resort style living is what you like, Miromar Lakes Beach and Golf Club is where you want to be!